This time I'm going to teach you how to make miniature brownies in just a few simple steps. In this recipe cork is going to be the main ingredient of this recipe. Collect some corks from wine bottles and chop a small piece until you have very itty bitty small pieces. Save the rest! It’s a very good material to work with! First, we’re going to chop some cork in very small pieces like shown in the pic here. NOTE: be CAREFUL when using the razor blade! Mix 1 piece of brown and ¼ of translucent. When the mix is ready add a small amount of chopped cork as shown in the picture. Note: you add translucent because only brown makes the brownies look heavy. The real recipe has butter so it has a certain degree of translucency. When the cork pieces are totally mixed with the clay, flatten the mix to 0,3/0.4 cm (remember the proportion = 1 cm equals 12 cm in reality). Cut a square as shown in the picture. Soften the upper edges a little bit with your razor blade. Start cutting 0,5 cm small squares (0,5 cm = 6 cm in reality). Now grab your needle tool of your choice and carefully texture the brownies, it’s very helpful having a picture of real brownies close to your working area. Notice that brownies are a sort of flat cake, so not too much of a “spongy” texture here only in small areas. Shade with brown soft pastel only the top. *Give a “moisture” look by varnishing the chocolate covers. 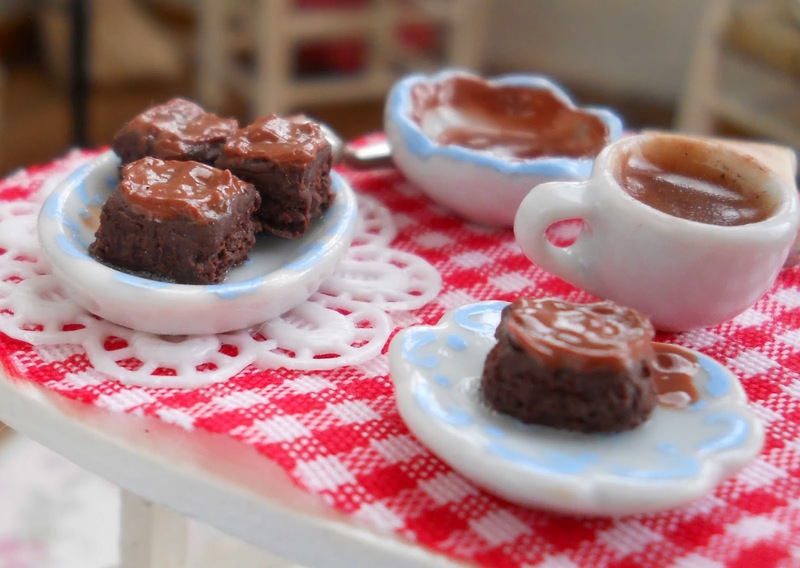 (*) Use 3D paint AFTER baking your mini brownies and letting them cool down!! (*2) You can apply the liquid fimo mix along with the finish brownie OR after you bake it. An interesting scene is one which has a feeling of “still life”, meaning that something is/was going on, an action. What I did to achieve this effect and make my scene more interesting was adding a bit of 3D paint or some liquid fimo (from the “ganache” for the brownies) into a small bowl plus putting a bit on a spoon too. Look around the internet for paper templates of old chocolate bars or labels, print it and put it into your scene. 1/12 pink frosted cake available at my etsy shop!